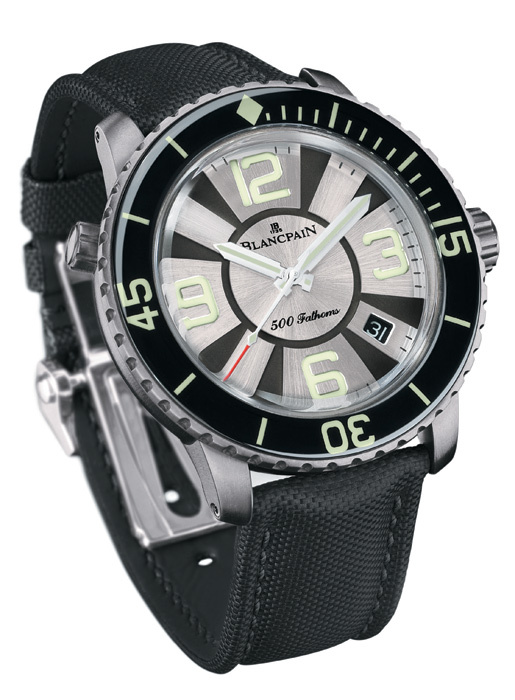 On the eve of the Baselworld 2009 watch show, Blancpain presents the “big sister” of its now famous Fifty Fathoms watch: the brand-new 500 Fathoms. More high-performance and high-tech than ever, the brand’s latest diver’s watch displays an uncompromisingly sporting design. Waterresistant to 1000 metres, it is equipped with a helium decompression valve that is vital when diving in a closed environment. The ultra-virile 500 Fathoms is fitted with a 48 mm-diameter titanium case – an unusual size for Blancpain. Presented as the ultimate sports watch, the 500 Fathoms is making a striking entrance into the collection of Blancpain diver’s watches. Endowed with a new face, a new size and new performances, the 500 Fathoms is water-resistant to 1000 metres. It features a brushed titanium case measuring 48 mm in diameter, equipped with a crown guard. Placed inside the case at 10 o’clock, a self-winding decompression valve guarantees the security and the reliability of the watch, without requiring any handling on the part of the wearer. To enhance readability, Blancpain has designed large phosphorescent Arabic numerals that are hollowed into the sunray-brushed metal appliques. The luminescent coating on the hour-markers, bezel markings and hands, along with the red tip of the sweep seconds hand, ensure optimal readability in all circumstances. 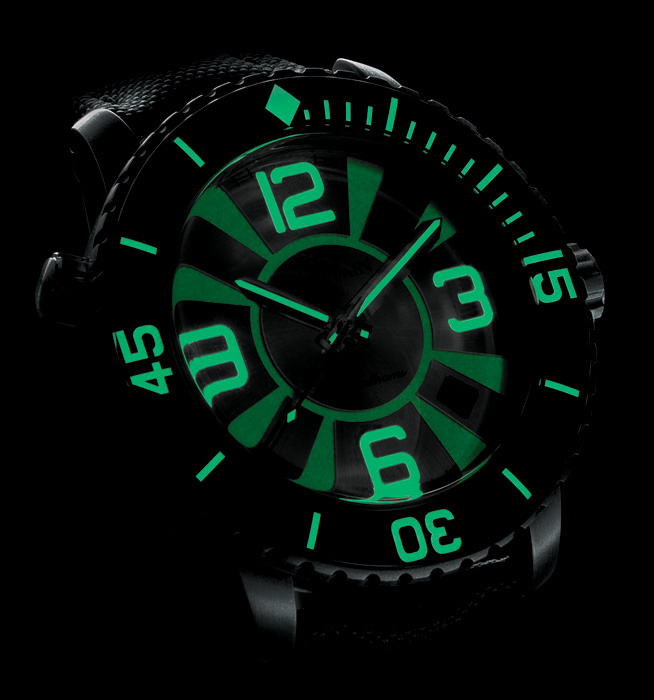 The luminescent base of the black dial reveals its fluorescence only in the dark, while the date appears in white against a black background at 4 o’clock. The unidirectional ratcheted bezel facilitates handling and avoids any involuntary extension of the dive time. Crafted in titanium and sapphire crystal, it features a gentle cambered relief that reduces the risk of impacts. The 500 Fathoms is powered by the self-winding Calibre 1315, specifically designed to equip sports watches. It incorporates a glucydur balance with micrometric regulating screws, which helps to prevent any jarring from disturbing the smooth running of the watch. Three series-coupled barrels guarantee constant energy and a five-day power reserve. The calendar system enables fast adjustment of the date at midnight in both directions. Another noteworthy feature of the 500 Fathoms is its sapphire crystal allowing one to admire its self-winding movement, as well as its engraved oscillating weight shaped like a boat propeller, without compromising either water resistance or safety. The new 500 Fathoms is equipped with a sturdy, sporty and watertight strap in rubber-lined black sail canvas. A brand-new triple-blade folding clasp secured with two pushers on either sides sets the finishing touch, while an additional rubber strap and the implement required to fit it complete the set which comes in an ultra-rugged presentation box designed to withstand extreme conditions. The performances and the reliability of the 500 Fathoms represent a major new technical accomplishment bearing the unmistakable signature of Blancpain, which is thereby eloquently reaffirming the expertise of its Manufacture in the demanding world of diver’s watches.